When I got this Girl Time Set with all the girly-girl images and sentiments, I immediately thought of my cousin, Linda, and making something for her with the set....she's ALL about purses (especially purses), shoes, shopping, and girly-girl things like that! Then when I saw Maki's post with this handbag card, I thought that's it, that's what I'm going to make for Linda...who's the definition of the term "40 and fabulous!" Here's a close-up so you can see the clear flower rhinestones I added to the letter "i" in "Divas" and to the clasp on the purse. 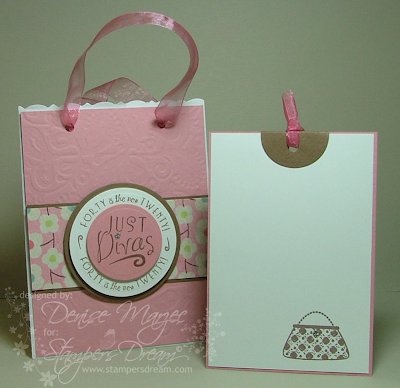 Most of the products I used on my project can be found at Stamper's Dream. Scroll down to the Supply List for product links. Here's a tutorial on how I made my handbag and card. You can click on any of these photos for a larger view. 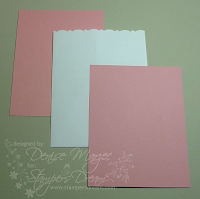 - Cut the envelope to 5.5" high, and then give it a decorative edge with one of your punches or dies. I used a Spellbinders Victorian Border Pierceabilities template for my bag. After cutting the border, my envelope is now 4-1/8" x 5-3/8"
- Cut two pieces of CS to 4" x 5-1/4" for the front and back of the bag. 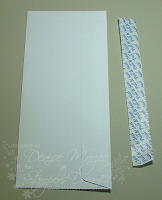 The panel for the back will hide the seam in the #10 envelope. My CS bases are Prism Crabapple Light. 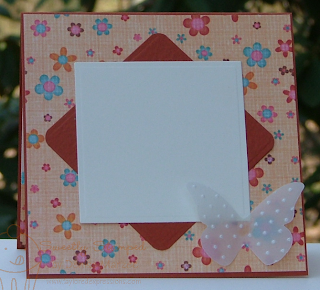 Then decorate the front panel (or both panels) just like you would decorate a card front. I embossed both the front and back panels with my Paisley Impressabilities template. 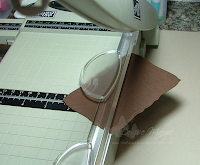 - Glue the front and back panels to the envelope and then punch holes in the top for the "handles" of the bag. 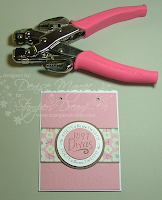 I used the May Arts 5/8" Sheer Rose Ribbon for my handles. - Cut a third piece of colored cardstock to 3-3/8" x 4-7/8" for the inside tag/card, then layer a white panel over top of that. Mine is cut 1/8" smaller all around. The Brown Suede circle tab was made with a 1-1/4" circle punch, then I just punched another hole in it with my Cropodile and ran some more Sheer Rose Ribbon through it. That's it! All three of my circles are up on dimensionals and I tied knots on the inside of the bag to secure the ribbon handles. Just like Maki mentioned in her post, if you limit the dimensionals or foam tape (I never limit the use of them, LOL!) and fasten the handles somehow that doesn't make the bag too thick, the entire bag and card insert will fit in a regular A2 envelope! I'm back with another sneak peek for Our Craft Lounge. This set is called Sandy Sunsets. If you like silhouette stamps, you're gonna LOVE this set! 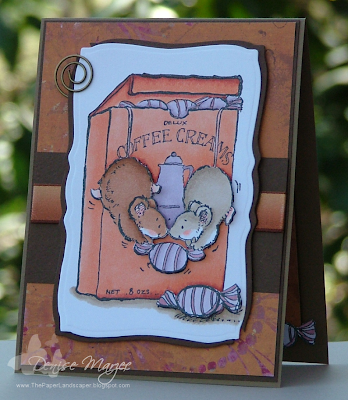 The layout is Karen Giron's Sweet Sunday Sketch. It's a 5" square card. I sponged the Wisteria DP panels and the main panel with River Rock ink. Michelle sent me these CUTE mini flower rhinestones from Stamper's Dream....so cute, thanks Michelle!! They're glued down with a small dot of crystal effects. I like how they match up with the black flower brad in the center of the Prima. See you on Friday with another OCL card and a giveaway! Yahoooooooo, Wisteria is now at Stamper's Dream and I'm beyond excited! I've been anxious to get this paper in my hands ever since I saw it on all the blogs during CHA. I needed me some gooooood purple/blue DP (why is purple DP so hard to find?? ), and I think this stuff is gorgeous. Thank you, Basic Grey! 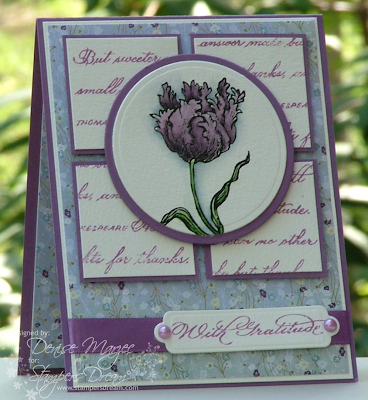 The layout is today's Timeless Tuesday Challenge #13...a sketch challenge from Cindy Haffner. The adhesive pearls on the sentiment were plain white, I colored them with a V15 Copic marker. The matted squares and the main matted circle are up on 1/16" foam tape. Hey gang! Our Craft Lounge is releasing a bunch of new stamp sets this Friday and Cami invited me to play along in the sneak peeks this week. Whoo-hoo, thank you, Cami!! I was excited just to get the email from her but then when I saw this Coastal Wishes set...OMG!...I was practically jumping out of my seat. 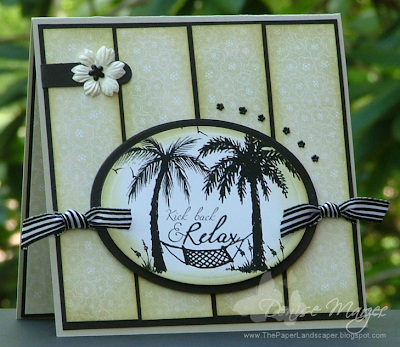 I love beach stamps!...I have a small obsession with them actually....and I absolutely LOVE this set. Hi everyone! I have two cards to show you today. 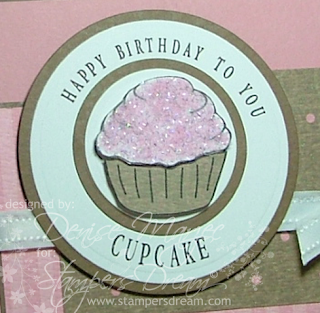 For this one I used my JustRite Celebrations Demi Phrases and 2-3/8" Wood Stampers with Cupcake Center. 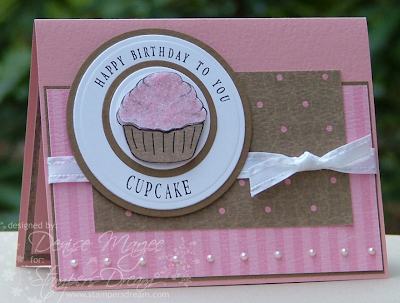 The cupcake was paper pieced and popped up on dimensionals. The largest Suede Brown circle is also up on dimensionals. The layout is Mojo Sketch #77 from March 9th. See the fluffy, sparkly icing? That's a new product from Our Craft Lounge called Sparkly Fluff and it's also available at Stamper's Dream. I tried using crystal effects and flower soft glue, but I wasn't getting the right effect with it....it wasn't coming out all smooth and pretty like I saw on Cambria's blog so I PM'd her. She told me the best adhesive to use with this stuff is a Quickie Glue Pen or the SU 2-way Glue pen. Worked like a charm, thanks Cami! 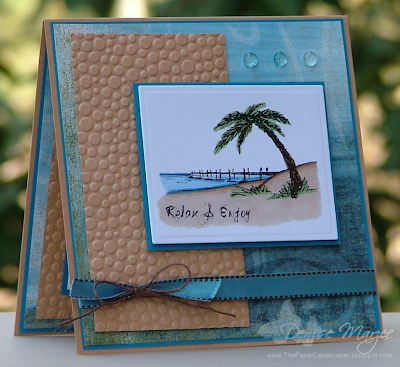 The next card is for Lauren Meader's NEW Color Challenge and Sharon Harnist's Weekend Sketch. 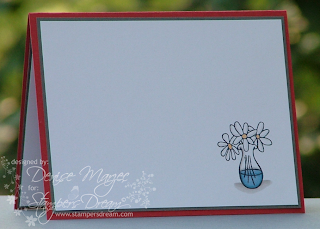 I used more of the OCL sparkly fluff ("sugar") on the daisy petals and yellow Stickles on the flower centers. All three of the deckled rectangles are up on dimensionals. Thanks for stopping by and enjoy what's left of the weekend! Here's a card for Taylor's TECC65 sketch. The clear flower in the center of the vellum butterfly and the Prism Frosted Teal CS were from my April Key Ingredients Subscription Kit. The Celebrate sentiment, clear tiny twinkles, caribbean satin ribbon (love love LOVE Taylor's Satin ribbon! 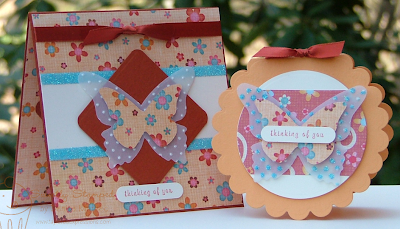 ), and Spellbinders butterfly Impressabilities are all available at Taylored Expressions. 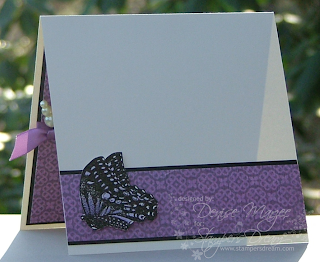 All of the white panels and the vellum panel were dry embossed with the butterfly Impressabilities. The white panels were then sponged with Cool Caribbean ink. *Edited Pic*...Here's the new picture of the inside of the card. When I originally posted this a.m., I didn't include the plain white/kraft panel....the textured panel wouldn't have been easy to write on, would it? Hehe! Anyway, now there's a smooth panel to write on when it comes time to mail out the card. It's going to be a GORGEOUS day today...going up in the 80's believe it or not...WOW! We're headed to our 4-year-old's t-ball practice this morning so I'd better get a move on. Enjoy your day!! My Mom-Mom (grandmom) asked me to make her some notecards so I decided to use the sweet papers and ribbon in the April Key Ingredients Subscription Kit and my Fresh Flowers set from Taylored Expressions. I took it a step further and decorated one of these PTI clear boxes with the same papers and image so she'd have a nice little box to keep them in. There are a total of six A2-sized cards (three blush red light and three blush red medium) and six envelopes that fit inside the box. I keep seeing all kinds of awesome cards with this Bloom & Grow DP, so I just had to pull mine out today. I also wanted to play with my new Critter Party clear set and this SUPER cool Butterfly Impressabilities template. I'm still figuring out all that can be done with it, but here I used it as a stencil and sponged around it. 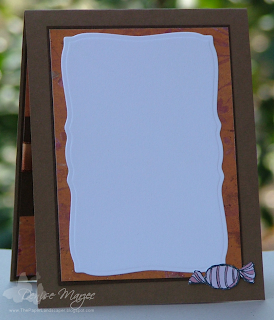 The papers, stamps, and Impressabilities template can all be found at Stamper's Dream. All the product links are in the supply list below. The cool layout is today's Twisted Thursday Challenge. I just recently found these challenges and I love them. 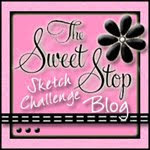 It's a sketch challenge with a "twist" thrown in. 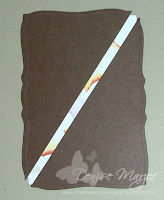 Today's "twist" is to pair the sketch with ribbon. Well, heck, how easy is that!! I colored my plain white pearls with a BG15 Copic marker. Yep, you guessed it, I'm going to be guest designing for 2 Red Bananas in May and June! Guess who else is joining me in the guest spot for those two months? ?....my girl, Silke!! Whoo-hoooo! HUGE thank you to Jami Bova and Jeanette Fincher-Lagniappe for inviting me to play along with the DT. I can't wait! Jeanette has lots of announcements today on the 2 Red Bananas Blog. Stop by and check it out. 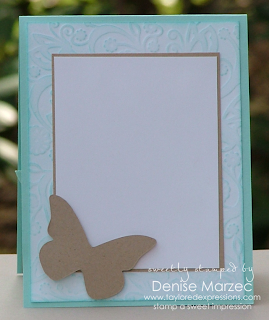 Today's Timeless Tuesday challenge is to make a card/project using acetate. Well, there was one card that's been in the back of my mind for weeks now....Cammie's Floating Kitty card. 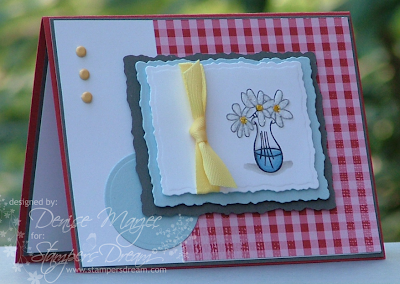 I LOVE how she made the circle "float" with acetate and I've wanted to try it ever since I saw her card. Thanks for the inspiration, Cammie! 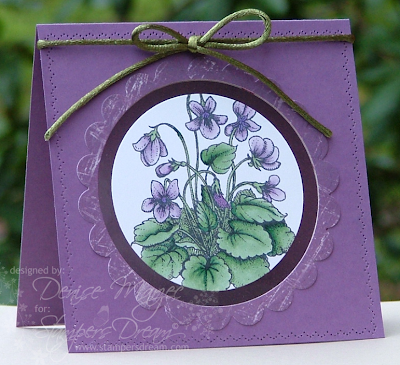 I used my new Flourishes Sweet Violets set from Stamper's Dream. Hi everyone! Have you joined in on Taylor's Key Ingredients Subscription Program? Check out THIS POST of Taylor's for all the details. 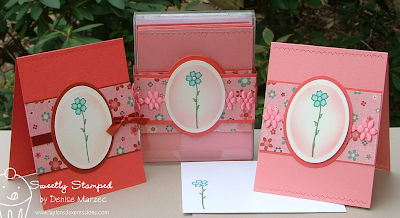 My cards today feature papers and embellishments from the April Key Ingredients Subscription Kit. 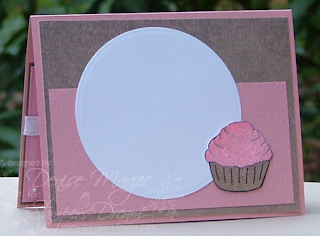 I decided to make a 5" square card and a circle card using my scallop circle nestie. On the square card, I added two strips of sticky tape to the buttercream CS and then sprinkled on some of the blue glitter...SUCH an easy way to add glitter to a card. On the circle card I cut out a vellum butterfly, embossed it with my swiss dots embossing folder, added crystal effects to the dots on the outer edge of the butterfly, and then sprinkled on the glitter. Crystal Effects is another great way to add glitter to a card. If you're already a subscriber and you've received this subscription kit, YOU can join in on our challenge by making a card or project using the kit and then upload to SCS with keyword TEKISApril. 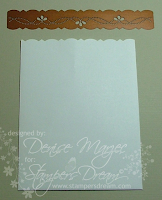 Feel free to use the papers and embellishments any way you like. Taylor also has a Mr. Linky box on her blog post today that you can link to. 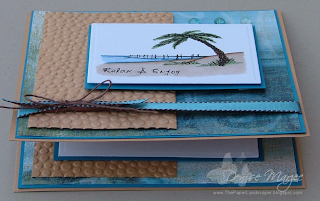 Stop by the following blogs to see more awesome samples with the April Key Ingredients Subscription Kit: Taylor, Sankari, Dawn, Laurie, Jen, and Karen! Hi everyone! I have a Northwoods card to show you today. 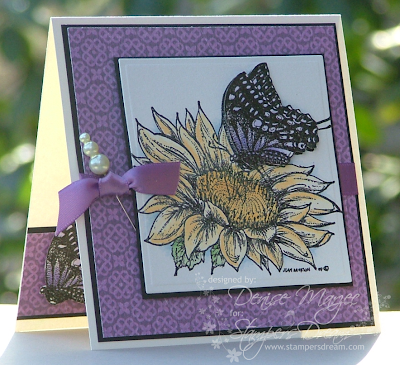 This stamp is called Closed Wing Swallowtail and it's available at Stamper's Dream along with the MME Maggie May DP and Neenah Natural White CS. The black mat panel behind the main image is up on Dimensionals. A second butterfly was colored, cut out, and popped up on Dimensionals. Here's a new stamp I just got from Stamper's Dream...isn't it cool?! It's called Candy Time. I love it!! You can also find the Madeline DP and Suede Brown Prism papers in the store as well. The other day I briefly explained how I made the mat behind the curved mega rectangle panel but a couple people had questions about it, so I thought I'd just take some pictures of how I did it. Scroll down below for the quick tutorial. That's it! Like I said, two of the corners aren't covered by doing it this way. 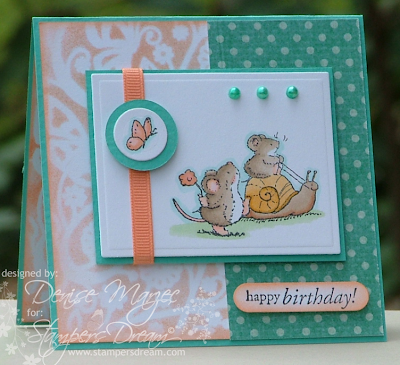 If you want ALL your corners covered, check out Michelle's awesome tutorial that she posted HERE. You rock, Michelle! After TOOO many days of rain, the sun is FINALLY shining again here in PA so I think we're going out to get some fresh air! Have a great day!